MPE Pump Monitor Relay - B&M Technical Services, Inc. 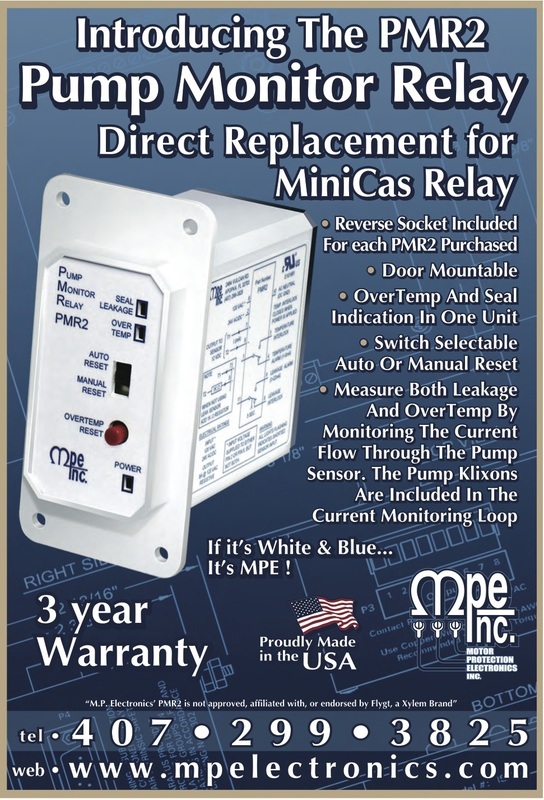 The Pump Monitor Relay provides Motor Over Temperature and Seal Leakage alarms for Submersible Pumps. Motor Over Temperature Alarm - The Pump Monitor Relay applies a low voltage DC signal to the Motor Thermal Sensor to check its status. If the Pump Monitor Relay detects that the Motor Thermal Sensor contacts are closed (normal condition), the Overtemp indicator remains off, and the Overtemp Relay is energized, closing the contacts between terminals 2 and 11. Seal Leakage Alarm - The Pump Monitor Relay detects moisture inside a pump motor by using a low voltage AC signal to measure the resistance across Leakage Probes #1 and #2, or between the Leakage Probe(s) and the grounded motor housing. A Seal Leakage condition is considered present when the amount of moisture in the motor causes the resistance between terminals 6 and 5 to drop below the setting of the potentiometer. When this occurs, the Pump Monitor Relay turns on the Leakage Indicator and energizes the Leakage Alarm Relay, closing the contacts between terminals 9 and 10.